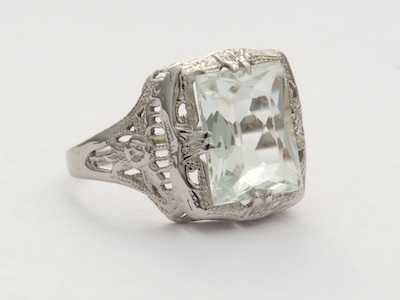 On this page, you'll find the latest additions to our extensive jewelry collection, including engagement rings, wedding rings, antique rings and other vintage jewelry. If you'd like to be notified whenever new jewelry becomes available, please sign up for our newsletter. Geometric angles, soft edges, and orange blossom accents come together in this enchanting antique engagement ring by Traub. An old mine cut diamond is set in a hexagonal starbust. This diamond steals the show amidst a six-pointed star that is set inside a hexagon. 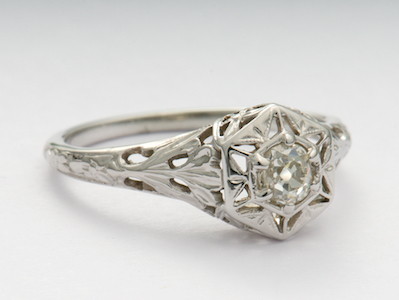 The band of this engagement ring is carved with flowers and leaves. Details: Antique. Circa 1920. 18k white gold. Old mine cut diamond; 0.29 carats. 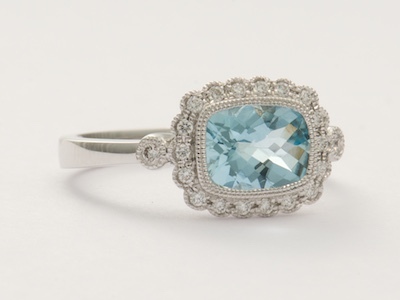 Set East-West across the finger, this vintage style engagement ring's aquamarine is a visual stunner. The gemstone is trimmed in mille grain and surrounded by diamond accents. These pinpoint set diamonds add a lacy edge. 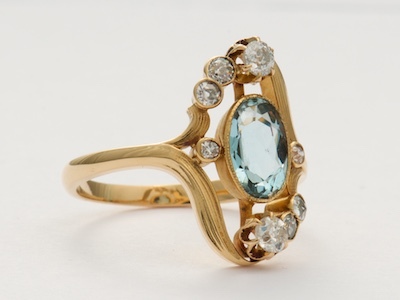 Two additional bezel set diamonds flank the aquamarine. A polished white gold band adds the finishing touch. Details: New. Vintage Inspired. 14k white gold. Round brilliant cut diamonds; 0.14 carats. Aquamarine; 1.46 carats. The diamond-accented tulips that dance down the center of this vintage wedding ring add a hint of springtime playfulness. 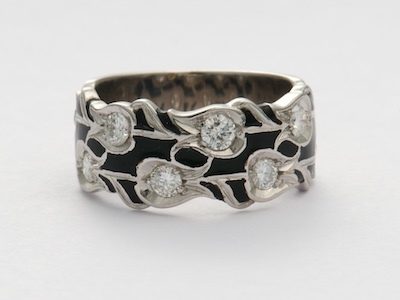 A black enamel backsplash offers dramatic contrast to the eight diamonds that highlight this wedding ring like dewdrops. These diamond accents are tucked amongst a double row of tulip bulbs and leaves that spread across the front and wind down the shoulders. 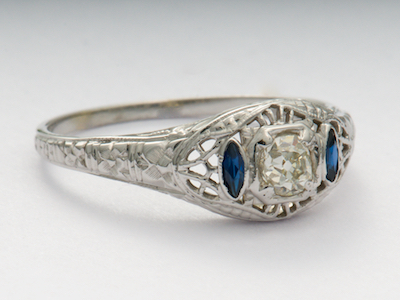 The thick white gold band of this vintage wedding ring hugs the back of the finger. Details: Vintage. Circa 1975. 18k white gold. Round brilliant cut diamonds; 0.5 carats. Like dandelion puffs dancing in the breeze, this vintage Retro wedding band sets lifetime wishes in motion. The pierced band of this wedding ring surrounds the finger in a playful display of swirling leaves. 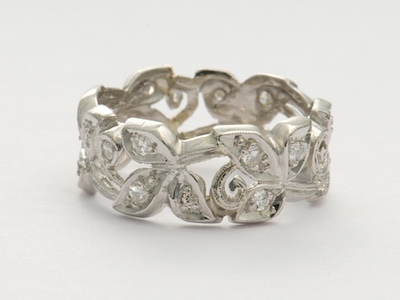 The leaf and scroll motif that spins around the finger in this wedding band is accentuated with twenty diamonds. These diamond accents pinpoint the center of each leaf in a nonstop array of shimmering radiance. Details: Vintage. Retro. Circa 1950. Platinum. Old style single cut and round brilliant cut diamonds; 0.355 carats. 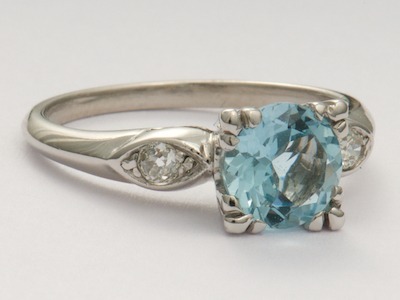 This vintage style engagement ring's blue zircon glistens with the colors of the ocean. 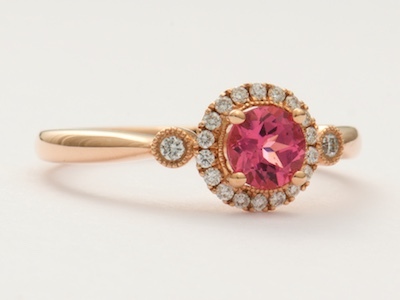 The gemstone is set in a scalloped bezel that romantically softens its edges. Mille grain trim and a rose gold band add to this romance. A collection of diamonds sits at the sides of the zircon and drips down the shoulders in an alluring teardrop design. Details: New. Vintage Inspired. 14k rose gold. Round brilliant cut diamonds; 0.14 carats. Blue zircon; 1.70 carats. 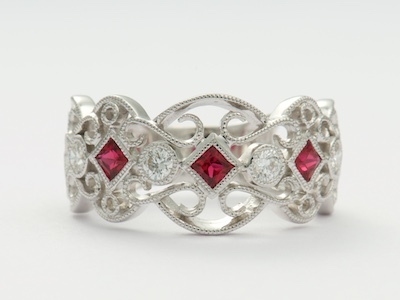 Ask your princess to marry you and begin your fairy tale with this vintage style ruby and diamond wedding ring. A trio of triangular rubies radiates from the center of the band and a collection of diamonds adds sparkle. 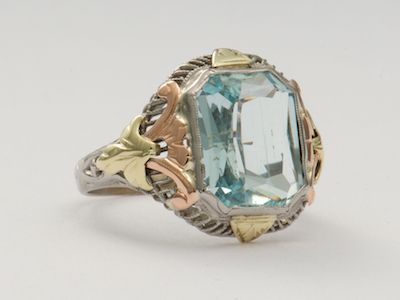 The metallic filigree that swirls around the gemstones provides a fantasy setting. Details: New. 18k white gold. Round brilliant cut diamonds; 0.26 carats. Rubies; 0.35 carats. 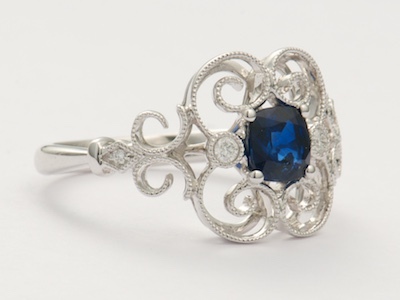 The treble clef design of this Victorian antique engagement ring sets the tone for harmonious musicality. 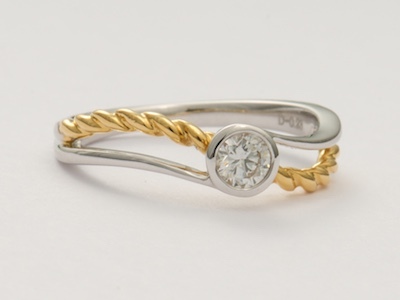 The ring's swirling design is accented with a collection of bezel set diamonds. Like dandelion puffs caught up in a breeze, these diamond accents spin up and around a dark cream colored natural pearl. Details: Antique, Victorian. Circa 1890. 14k yellow gold. Rose cut diamonds; 0.06 carats. Natural pearl. 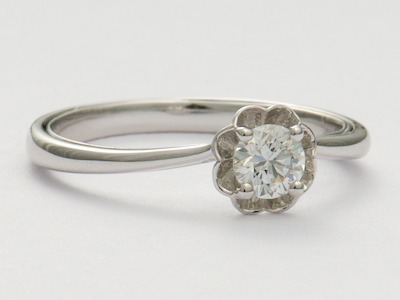 Scalloped rose petals fan out around a diamond in this bewitching vintage style engagement ring. The dainty design of this ring begins with a slim, polished band. The band culminates with a multi-petal floral mounting. A round diamond is nestled in the center of this profusion of flower petals. Details: Vintage style. New. 18k white gold. Round brilliant cut diamond; 0.27 carats. 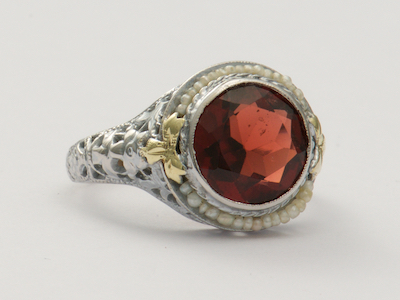 This antique ring's almandine garnet radiates with the intensity of a blood moon. Flirtatious gold bows play peek-a-boo at the sides. Fiery hot, the gemstone is encircled by a cool pool of pearl accents. Flowers and chevrons are carved on the pierced band. Details: Antique. Circa 1940. 14k white gold. Garnet; 2.06 carats. Natural and cultured pearls. This vintage ring's onyx provides a dramatic backdrop for its delicate diamond centerpiece. 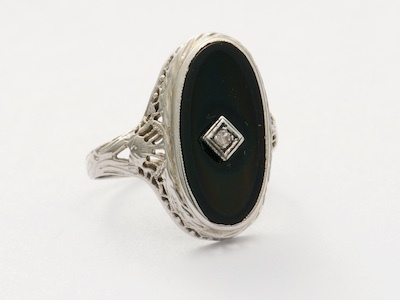 The table cut cabochon black onyx bathes the finger from base to knuckle in ebony. 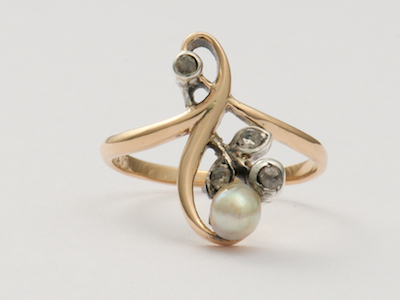 Nestled at its center is a round diamond. The white gold setting is pierced around the girdle and at the shoulders. 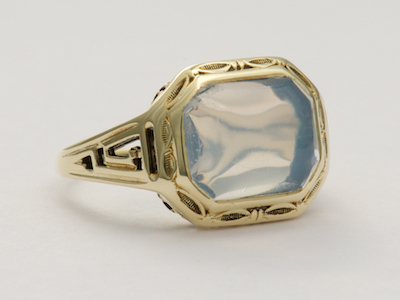 Engraving extends down the side of this vintage ring's band. Details: Vintage. Circa 1930 or later. 14k white gold. Single cut diamond; 0.025 carats. Black onyx. 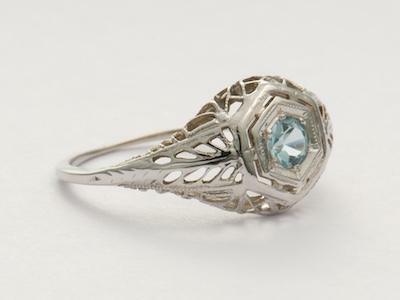 This Edwardian antique aquamarine engagement ring has a beautiful pierced mounting. 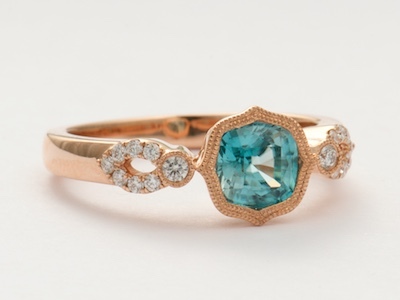 Tucked in the center of the double hexagon setting is a blue green aquamarine. Dainty peeks of lattice filigree spill down the shoulders and shank of this engagement ring adding to the visual appeal of the design. Details: Antique. Edwardian. Circa 1920. 14k white gold. Round aquamarine; 0.18 carats.